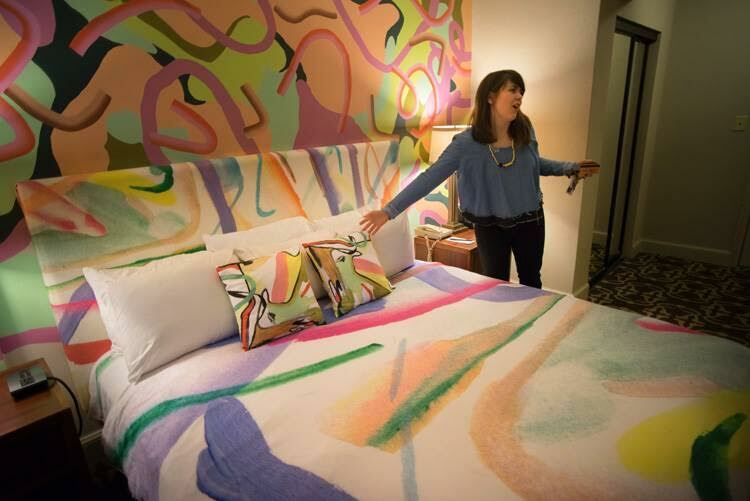 Hotel art isn’t usually considered a part of the larger contemporary art dialogue, but in downtown Kansas City the Hotel Phillips is host to an artist-in-residence program. 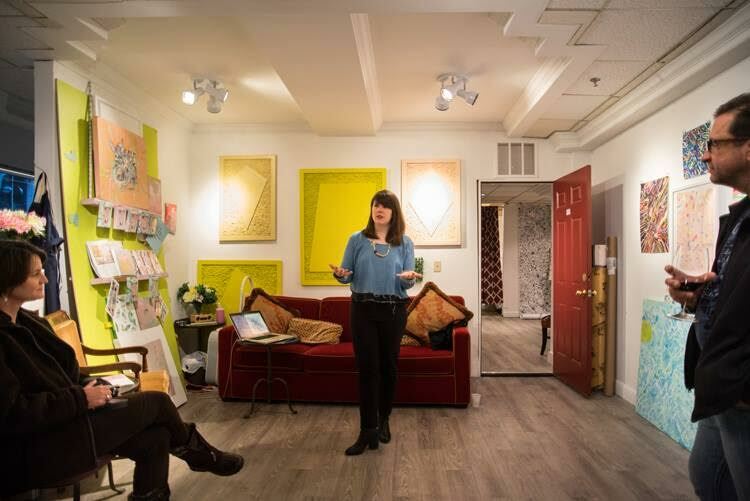 This year the program featured Madeline Gallucci in their store-front window studio space and in a new artist suite. Gallucci’s work in the space was responding to the day-to-day activity of the hotel. The staff and guests at Hotel Phillips became a crucial social component to the work she was creating. 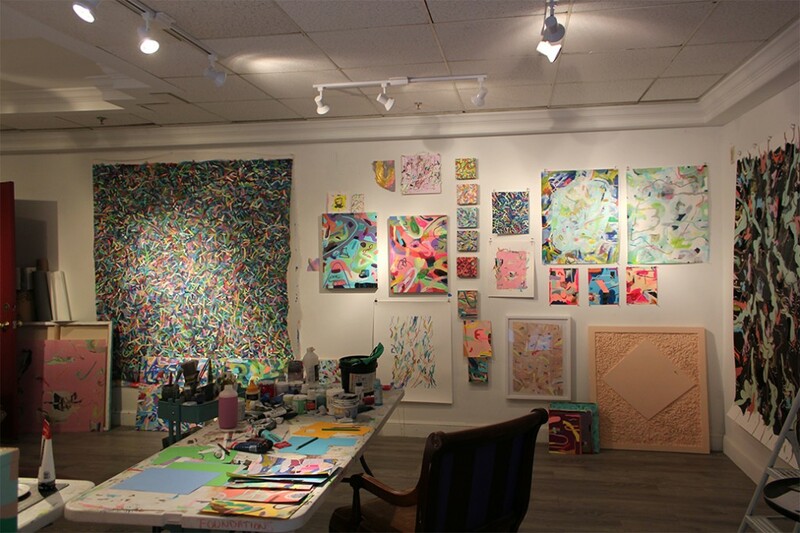 When Gallucci is not at in her studio, she is Co-Director of Front/Space in Kansas City’s Crossroads Arts District. Melaney Mitchell: Let’s start with the big picture one what questions do you try to answer in your studio? 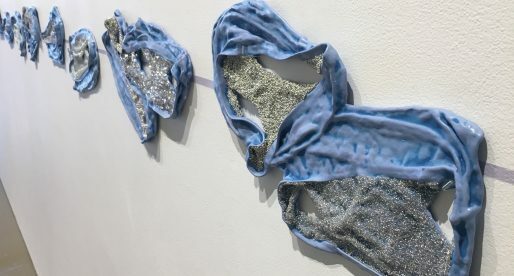 Madeline Gallucci: This has changed tremendously over the course of my residency. With this being such a public position, a lot of my studio practice and the ideas that I had investigated for a long time have dovetailed into a new conversation with a different audience. My studio has been situated downtown for the past three years which has lead to a lot of exploration of this area along 12th street between Walnut and Wyandotte. I had my Charlotte Street studio for two years in Town Pavilion. I have done projects at Paragraph Gallery and at Oppenstein Memorial Brother’s Park. I’ve had a lot of experience with this area and now feel that the questions I ask in my studio are more centered around answering ‘what is the role of an artist in a hotel’? The residency is running parallel to the lives of guests who have may have never really interacted with art before or are intimidated to start or maybe they’ve never seen an artist in this context. Being situated in the giant window overlooking the valet becomes a very performative way to make work, especially at night. MM: So your work has gotten larger since you have been here? MG: Yeah! It has gotten larger but I also have been making a lot of smaller collage pieces as well. It’s a new experience with the window space, things like keeping tidy and keeping work on the wall, it becomes a balance between what people think an artist does and what an artist actually does in the studio. The residency is just as much about the debris that accumulates on the floor as it is interacting with the hotel staff, valet, front desk, housekeepers, and the guests. I’m definitely learning a lot about the hospitality industry. So back around to the biggest question for me is ‘why art here’ and ‘why is this important’. Though, this has always been a crucial question and conversation for me in my practice. MM: It seems that with your job as Campus Events Coordinator at KCAI and being one of the new directors of FRONT/SPACE do you feel like the work is relating to the idea of a party or being a hostess in any way? MG: Yeah, I had a studio visit last night where someone mentioned I make very social work and I had never really thought about it in that context. I am the only artist here at Hotel Phillips, so it is not like in the Charlotte Street residency where I was surrounded by a community of artists. I like that idea of “social work” because I am a very outgoing person and have to interact with a lot of people in every job that I have. Thinking about my work like a party is very fitting for me since I have had a lot of moments where I am making work with other people or friends are hanging out in my studio. My practice is a very socially minded process whether I realize that is part of the work or not, it is something that I enjoy doing. 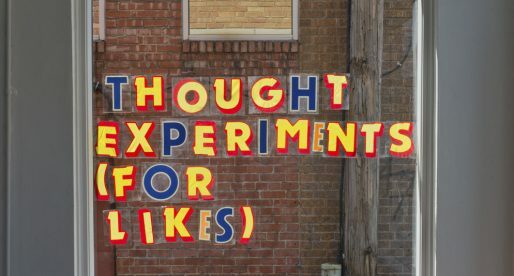 I like that it is feeding into the work visually, thus giving other people that perception. MM: So this space becomes so much more important to you than being in the corner of some west bottoms studio? MG: That is something I really like about this position, demystifying how an artist makes work. People come through here and they expect someone in a dark corner brooding with a beret. It’s great to shift those stereotypes and show them that artists do many things and wear many hats. MM: What helped you transition out printmaking and into painting? MM: Has your work changed at all after creating the artist suite? 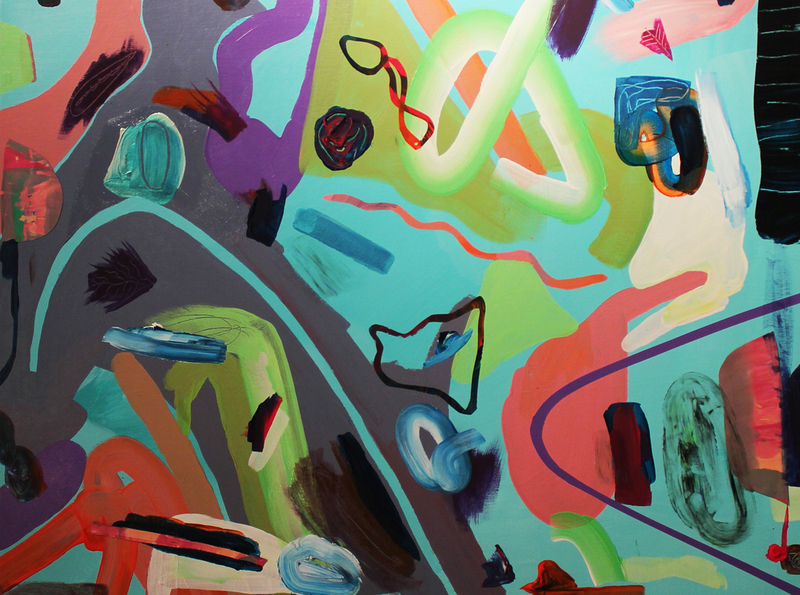 MG: The room was a perfect next-step for my work, as I have had experience with wall painting last summer in my show Confectionary at Plug Projects and wanted to explore that further. It was the first time the hotel ever did something like that and they put complete trust in me. They hope that later down the line other residents may do something like that as well and they’ll have a whole collection of suites. When I talk about my time spent working in the suite I always tell people how conducive it is to making art. The bathroom is right next to you with a shower, you have a bed to take a nap in or stay over if working late, there is cable tv, wifi, room service. It was an awesome experience in the middle of January dead of winter and I could just work obsessively and watch HGTV. The ideas I had when working on the room are still feeding into my other work and I’m thinking about other spaces that could translate into. I’ve always been interested in making my own patterns for objects I paint and print on. Another exciting partnership is that a portion of the cost of this room goes back to Hello Art, cycling back into funding artists projects and programs. MM: You have this piano covered in a painting too? MG: The piano is part of an event sponsored by Keys 4//4 Kids and the KC Music Teacher’s Association called Pianos on Parade. 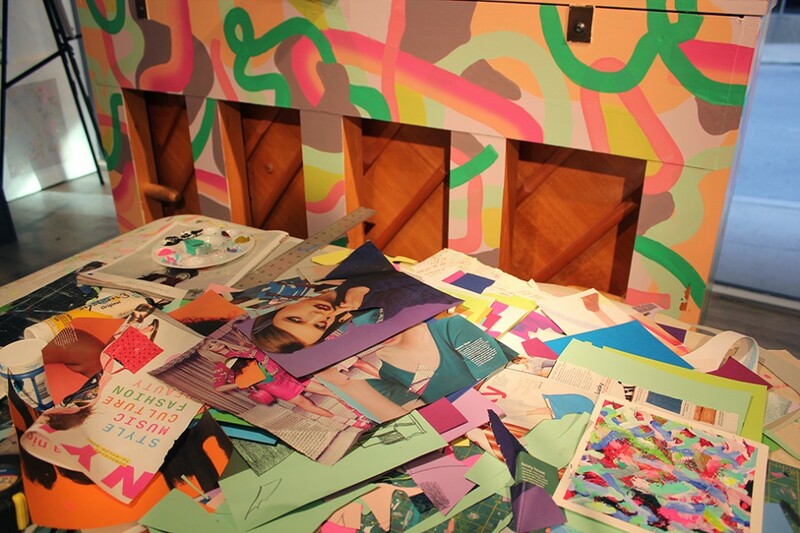 Artists from all over the city are paired with a corporate sponsor who purchase a piano for them to transform. The event is happening all over the city this summer so keep a look out! This is an example of the kinds of charity events that the hotel is involved in and I get to participate as being the Artist in Residence. It definitely made sense with my work since I am interested in wrapping my paintings to transform objects and spaces. MM: What are your feelings on normal hotel art? MG: Since being in this residency I have become much more observant to art in “uncommon” places including hotels and other corporate settings. It’s hard to say whether it’s better to have bad art than no art at all. There is some good stuff out there, some businesses who are trying to appeal to more art-savvy customers and others that just buy from a catalog. 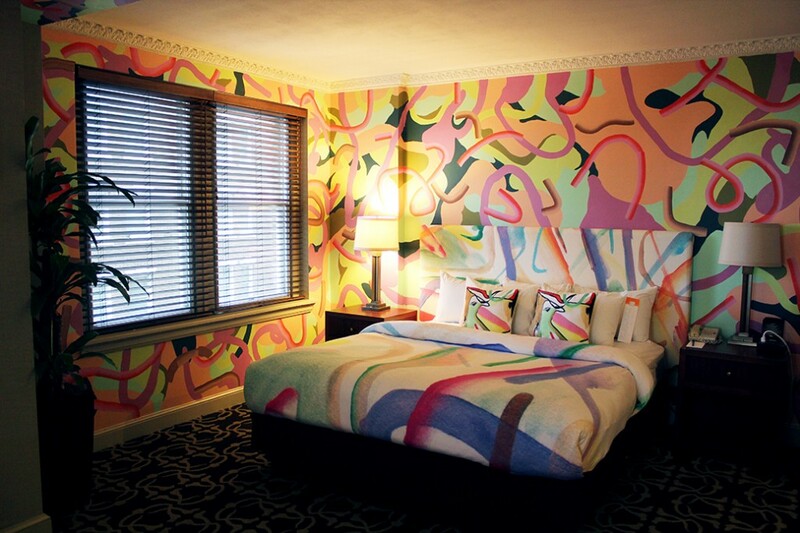 A lot of boutique hotels are looking towards collecting artists or curating rooms and suites. Hotels are catching on to how art can really transcend their guests expectations and experiences. It gives them something to talk about and tell their family and friends. There are some wall pieces designed by an interior decorator at Hotel Phillips that live alongside my work. When you exit the elevator there are giant painted faces of women, and some people assume I made those as well since I am the Artist in Residence. As you know I paint a lot of portraits of people (chuckle). Guests love them though, and when I search the Hotel Phillips hashtag on Instagram, a lot of people take pictures of them alongside studio shots of my work. It gets really interesting how people start noticing art or other things outside their expectations of the hotel and begin to lump them into the same experience. MM: At least its not leaves! MG: Definitely. Going back to your original question, when i think of bad hotel art I visualize a landscape with two trees in a soft brown hue. When you think about the gamut of what hotel art can be there is definitely a huge aesthetic differences between Best Western and the W.
MM: Do you feel like you are taking from what you are doing in your studio at Hotel Phillips to what you are doing curatorially at Front/Space? MG: With Front/Space the decision making is split equally between myself and Kendell Harbin, my collaborator and fellow co-director. We try to show work that we feel is thoughtful, exciting and challenges the idea of the traditional Crossroads and First Friday experience. I feel like there is definitely some conceptual and aesthetic overlap with the projects we facilitate at Front/Space, however all artists we’ve selected for our 2015 season have been found through our Open Call. I try to treat my studio and FS as different entities as the decision making process with Front/Space is much more administrative for me. However the most common thread of course is that the space is also in a store-front window! With the Cissy Room back in March, I could see some overlap while I was working on the hotel suite and the most recent show with Dana Lynn Harper there was a very similar shape and color palette to her work. 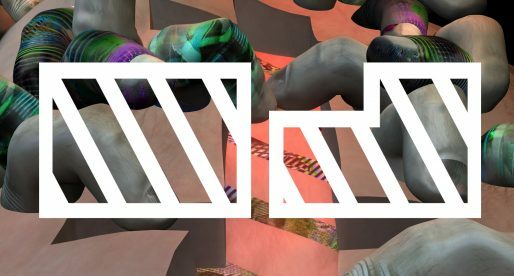 Moving forward with Front/Space, we hope to create a diverse program schedule with everything from performances, workshops, publications, music, conversations, and traditional exhibitions. MM: You both went to the Open Engagement conference this year and that was all about social practice, is that a medium that interests you? MG: Kendell and I were awarded a staff development grant at KCAI that allowed us to travel and participate in the Open Engagement Conference. It was an opportunity to expand ideas for the new Social Practice certificate program at KCAI, strengthen what we do at work and inform our continued interest in these types of practices. Also traveling as Front/Space we were able to talk to people about a variety of projects and share ideas. It was a new experience for me, as Kendell comes from a background of social practice art making and I have a more traditional studio practice. MM: Yet you are playing host a lot in your studio. If your traditional practice is becoming more and more social, isn’t that a type of social practice? MG: Yes. This residency is extremely socially engaged. I host public programs and conduct workshops with the hotel guests as well inviting them into my studio just to see what I’m up to. There is a full spectrum of what can be considered social practice, which is why I enjoyed the conference and could relate it back to my residency. Often times I feel like the word “facilitator” or “ambassador” is more relevant that “resident” when it comes to this position in the hotel. A lot of my conversations circle back to why is art important and how it relates to Kansas City and how it supports our community. It’s always interesting when people come in from different cities and they have never seen anything like this. Its great to see how people are responding to this residency. I went to Milwaukee recently and stayed at the Pfister Hotel where the program originated and there was a very different feel to their program. Here I feel lucky that it can be understood that things can get a little messy and that an artist is part of a bigger community. We are very fortunate that this program is rapidly evolving and is happening right here in Kansas City. July 2015 Second Friday Radar!